Do you have the right kind of seeds? Can you save the seeds from your harvest to plant next year? 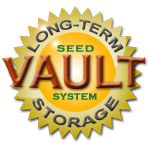 With our Seed Vault, growing your own survival garden becomes easy. Be assured, our seeds are not hybrid or genetically modified. You save your harvest seeds from this year and have more than enough to plant next year. You never have to buy seeds again! Not possible with hybrid or GM (genetically modified) seeds. Seed Pack ContentsNow you can grow your Survival Garden for bountiful harvest anywhere in the country. Chosen for varieties that will grow in all zones.